On December 28, 2016, our 19-year-old client, Toni, was a passenger in a vehicle that was being driven by her mother. Toni was looking forward to shadowing her mother at work that day. While passing the intersection of East Gun Hill Road and Hull Avenue in Bronx, NY in the left lane, an ambulance in the right lane attempted to make an illegal u-turn and crossed in front of Toni and her mother’s vehicle! The ambulance struck the passenger’s side where Toni was sitting. Toni remembers hitting her head on the dashboard, but her adrenaline kicked in and she immediately went to her mother’s aide after the accident. The driver of the ambulance got out of his vehicle to check on them and said, “I’m sorry, I didn’t see you!” Tony was transported by ambulance to the emergency room at Montefiore Medical Center where she was evaluated, treated, and released home with pain medication. As a result of the incident, Toni suffered injuries to her neck, left shoulder, left hand and mid-back. She described the pain in her neck as shooting down her left arm with a tingling sensation around her fingers. Her injuries limited her ability to perform household chores and normal daily activities. Toni attended physical therapy four times a week for several weeks. When minimally invasive and conservative treatment failed to improve her condition, she underwent trigger point injections to her left upper trapezius muscles (back/shoulder area), left levator muscle (rear side of the neck), and left deltoid muscles (shoulder). 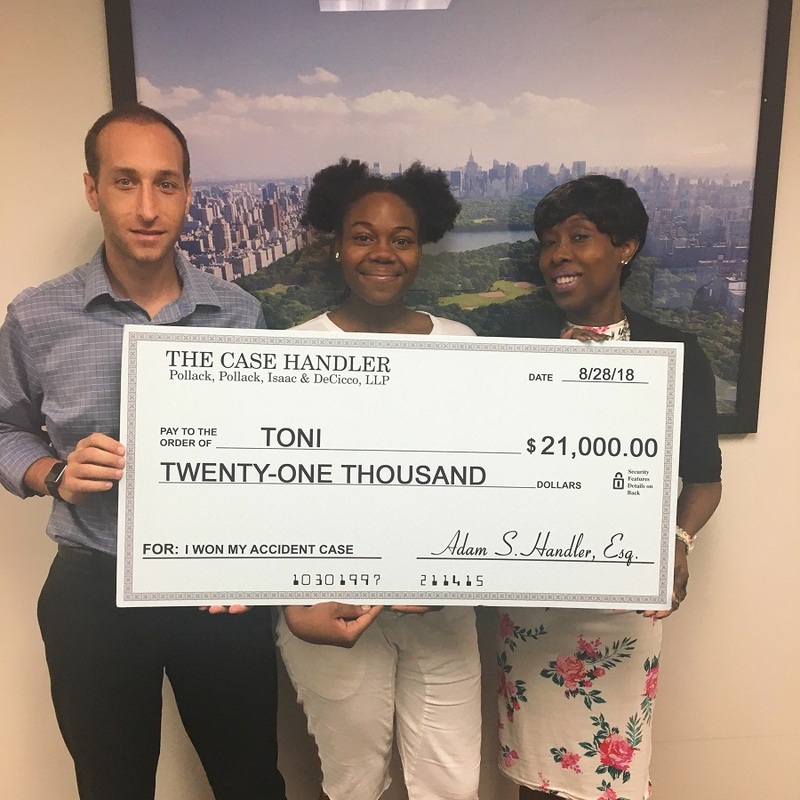 A church member had heard about Toni’s accident and happened to mention that her own sister was also involved in an accident and hired The Case Handler team! Thanks to the church member’s recommendation, Toni called our office right away. With the help of our personal injury team at Pollack, Pollack, Isaac & DeCicco, LLP, Toni was able to receive all the medical attention she desperately needed without the burden of her medical bills and legal battle with the insurance company. We handled all the negotiations with the insurance company and made sure that all of her medical bills were paid! With our help, Toni successfully recovered $21,000.00! From the day an accident happens until settlement day, there’s a lot that goes on in between that we don’t talk enough about. While it is our favorite moment standing side-by-side with our client holding the large and widely-recognized settlement check, it is often not an easy road getting to this day. Thanks to Toni’s honest experience, she had a difficult time making it to doctor’s appointments and she struggled quite a bit after the accident physically and mentally. It is a life-changing event to go through and our team will be right there with you from the beginning to the very end. If you were injured by an ambulance or other type of vehicle, contact a trustworthy Bronx ambulance accident lawyer that will stick by your side and encourage you every step of the way till settlement day.